Surges are sudden and unexpected spikes in voltage that travel throughout your home’s electrical system. Some surges come from within your own home, such as turning on a dryer or sending a document to your printer. Other surges come from outside your home, as in electric utility switching, downed power poles, cut power lines, and lightning strikes. Surges can even enter through cable televisions and telephone wiring. For example, if lightning struck a Montreal area home, or somewhere around it, a surge may go through the electrical system and anything that is plugged in may get “fried”, whether it is turned on or off. Homeowners end up having to pay out of pocket to replace these appliances and equipment. At Novatek Electric, we can save you from having to replace appliances and equipment due to power surges. Most Montreal homes have some type of expensive electronic equipment in it; for example, kitchen appliances, water heaters, etc., which are vulnerable to power surges. These items can be protected with a whole house surge protector installed by your professional Montreal Electrician, Novatek Electric. Additionally, entertainment equipment and/or computers can be protected with a surge bar. Some of these affordable surge protectors come with a lifetime warranty and cover up to $25,000.00 worth of appliances. Call today for more information. Don’t wait for a surge to zap your electrical appliances and entertainment equipment! At Novatek Electric, we will ensure your electrical appliances and entertainment equipment is safe from power and lightning surges that may strike your home. Our electrical contractors are licensed and fully insured, with years of experience providing electrical services like whole house surge protection to homeowners throughout Montreal. With years of experience in the electrical industry, you can count on Novatek Electric for reliable, quality services. When you hire us for surge protector installation, you will receive quality work from trained electricians that know how to ensure quality results and protection. 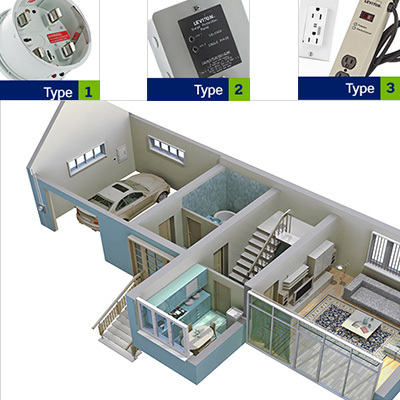 If you are looking for a Montreal Electrician, please call 514-852-9300.